A magnificent indoor bonsai with stunning aerial roots from the branches. This ficus bonsai tree is truly incredible, with its incredible trunk flow and powerful branches. Neat pads of emerald green foliage are set off by the contemporary black ceramic pot and rectangular drip tray. This indoor ficus bonsai is full of character, and words cannot fully describe the impressiveness of this superb bonsai. From the striking pot to the vivid leaves, this bonsai has it all. Unique, unusual, and perfect in every way, this bonsai will turn any home or office into a place to be admired. The Ficus Bonsai tolerates lower light levels than other indoor bonsai and is easy to care for, making it ideal for anyone. 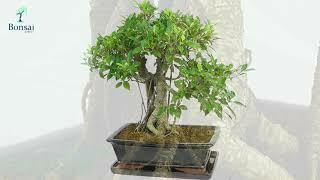 With large, glossy green foliage, the Ficus bonsai has excellent proportions, and has many other great characteristics. Or choose your delivery date in the checkout. For more information see our video below the main image. This Ficus indoor bonsai tree is truly incredible, and has stunning aerial roots. The Ficus bonsai is easy to care for, and is ideal for anyone. Ptted into a forest green fluted ceramic pot, this bonsai is spectacular! *This bonsai is 57cm in height. * The trunk diameter is 6 cm. * The pot size is 37 x 30 cm.